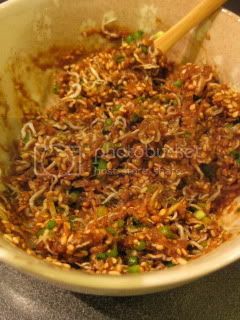 One of the regular items I make with my homemade miso is "Banno Miso Sauce" (all-purpose miso sauce). I'm not sure if I wrote about it before, so here it is again. I combine above ingredients in a sauce pan and whisk over low heat until it's thickened and shiny for about 10 minutes. This sauce is so versatile, as I can use it as a topping for meat or fish, or mix it with vegetables, etc. With this Banno Miso Sauce, I made a wonderful rice dish. I think it's very hard to find Japanese people who don't like the combination...miso, scallion (or chives), and toasted jako (dry baby fish)! 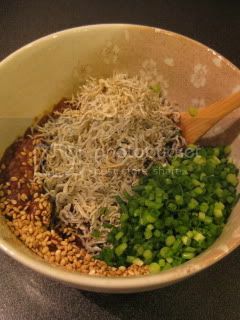 So, I mixed 2T Banno Miso Sauce, 2T roasted sesame seeds, 4-5T jako, and 2T minced asatsuki (Japanese chives). Wow, this mixed paste itself tasted amazing. Then, I made wonderful fluffy rice with my double-lid donabe rice cooker, "KAMADO-SAN", and added the above mixed miso paste to the rice and tossed together. 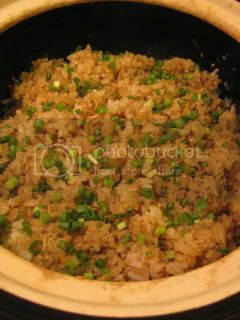 Wooow, the aroma of the miso mixture was enhanced with the steam of the rice and it was incredible. 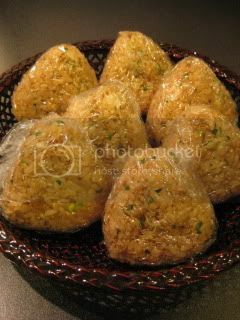 I even made it into onigiri. The taste was even more incredible!